Small chips about an inch in diameter and a bit thicker than a potato chip, a wonderful Thai snack with a tender kick from pepper powder. Packaged in a nice tall strong metal can (8.5 inches high). Easy open lid and separate plastic top to keep fresh. 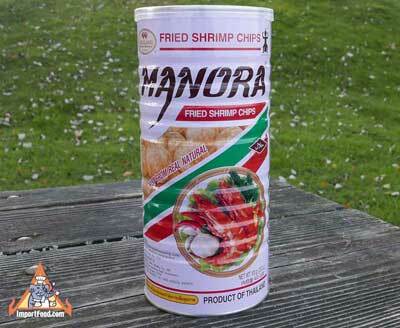 Ingredients: tapioca 45%, fresh shrimp 35%, palm oil 10%, garlic 5%, salt 2.5%, pepper 1.5%, msg 1%. No artificial color added, no preservative added. Net weight 3.88 oz.